Squid is one of those ingredients I don’t often cook with due to a deep fear of incompetence. You’ve got to cook it fast. In and out. It has been said that you can cook it slowly, but I never quite believed it was true. Even when I got it in and out, at least I thought I did, it was still not as meltingly tender as I hoped. So how could it be tender when you cooked it for half an hour? 40 minutes? It couldn’t be possible, not without hours of slow simmering. But it is possible. This was the best squid I have ever made. 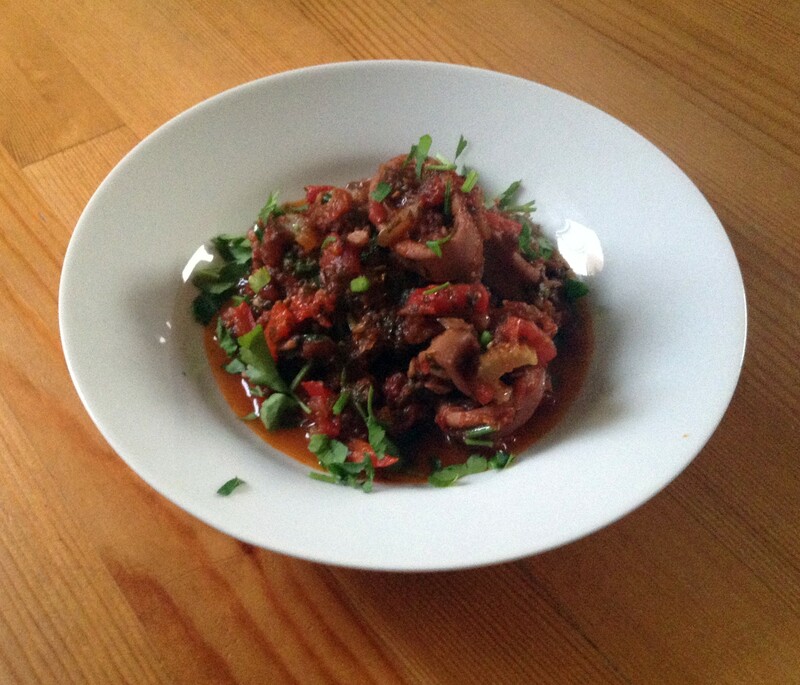 Braised until tender in tons of garlic and parsley and plenty of tomatoes; it was the Mediterranean in a bowl. If it had been topped by a lemon, parsley and garlic gremolata I think that would have taken it to the next level, so will definitely try that next time. So next time you have some squid on your hands, let it cook low and slow and be ready to be amazed at the results. 1. Clean the squid and cut into 1 inch wide rings. 2. Heat oil over medium heat in a large heavy pot and cook the 2 cups of parsley, garlic, fennel seeds and red pepper flakes together for 2 minutes stirring frequently so the garlic doesn’t burn. 3. Turn the heat up to medium high and add the squid. Cook for a further minute, stirring frequently. 4. Add sun dried tomatoes and 3/4 cup wine, chicken stock or water and simmer uncovered until the liquid is reduced by half, about 10 minutes. 5. Add tomatoes, remaining 1/4 water and season with salt and pepper. Simmer covered until squid is tender, 30-40 minutes. 6. 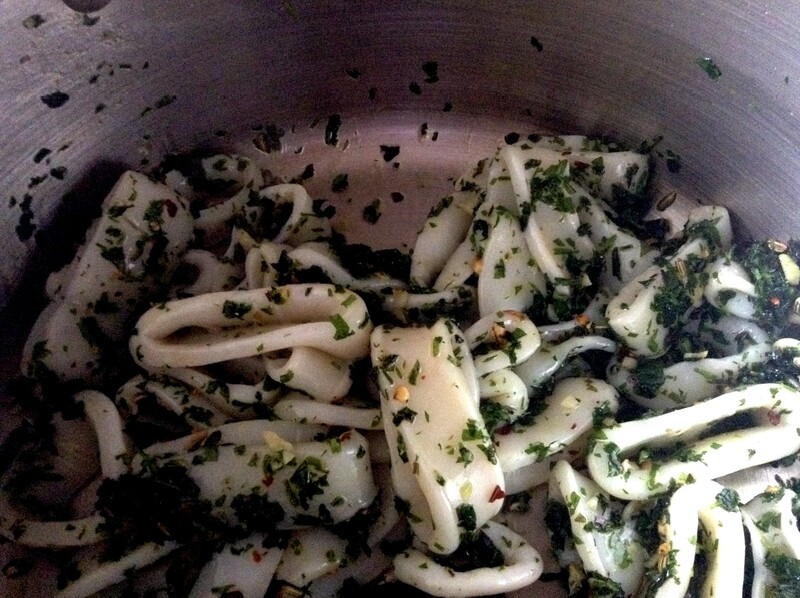 While squid is simmering, mix together ingredients for gremolata, if using, and set aside. Serve with crusty bread or with orzo, rigatoni or polenta. wow, that sounds good! Love squid. One of the reviews said to watch it because the squid got tough with too much cooking, but I think maybe it hadn’t got tender yet. Who knows though, I’m no expert! Wow that looks delicious. Yes you do always have to worry about making it rubbery, but you seemed to have nailed it! Yum. I love that you added sun dried tomatoes. So good! They are so savory, I love their flavor. Now! This is one exciting dish..